Special Announcement! Wanted Dead or Alive Impish Dragon ! Known to plunder Entenmann’s Delivery Trucks, Dunkin Donuts Shops, Taco Bells, All You Can Eat Buffets & Sororities. In addition he will leave a trail of cigar butts, plundered Italian Restaurant and dumpsters and sexually frustrated former virgins by the score in his wake. He is believed to be headed for either New Jersey, the Coronado California area, the US Canadian Border or the Mexican Boarder around Arizona & New Mexico. The Texas Border has been secured as all those along it have been informed that Dragon tastes like chicken fajitas. Montana, Colorado, and Utah Separatist Groups have all been placed on watch and told he’s a Government spy. All Mythical Borders and off realm exits have been closed. ICE and Homeland Security have been advised and are treating him as a potential homegrown (ok, their exact word was ‘fermented’) terrorist threat due to the possibility of his mouth and behind being WMDs. 1 Response to Special Announcement! 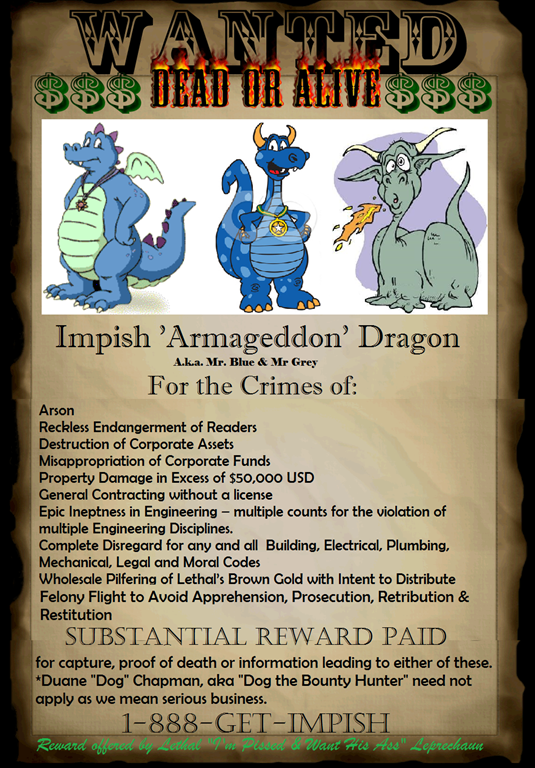 Wanted Dead or Alive Impish Dragon ! poor boy. Must say you did an outstanding job on the special announvement!